0000 – Trip odometer (re)set as we left home in Washington DC on a 2-1/2 week adventure. 0927 – Stopped for the night in Columbia, MO. 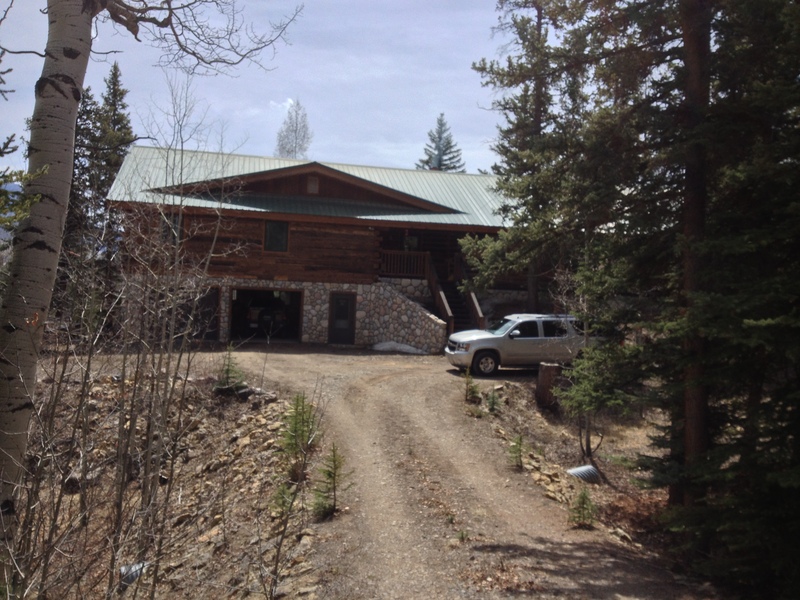 1837 – Stopped at friend’s cabin in Creede, CO for 5 days. Hummingbird mania off the back deck! 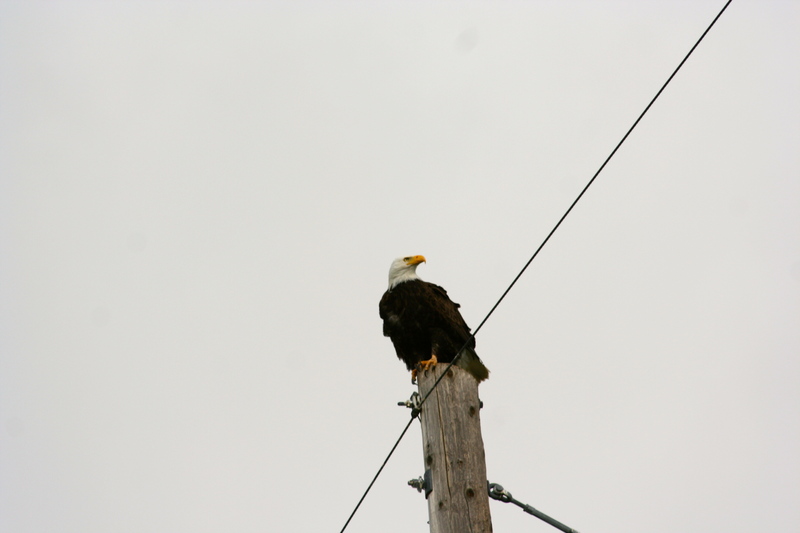 Make sure you have your sound on – they were noisy! 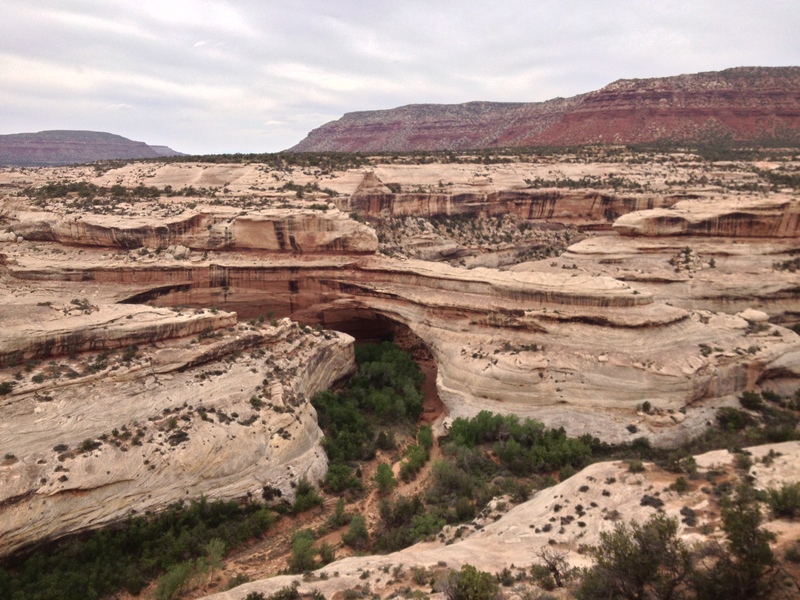 2177 – Visited Natural Bridges National Monument in Utah. 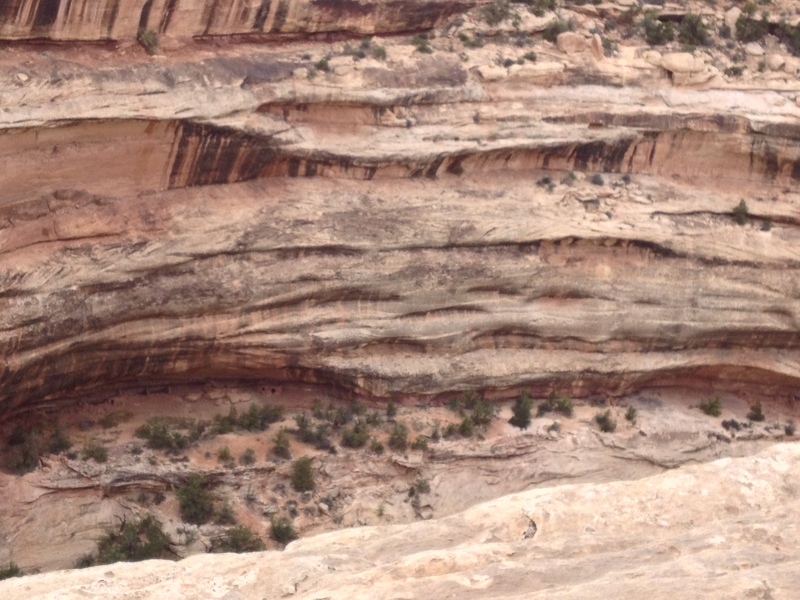 Cliff dwellings visible near bottom left side. 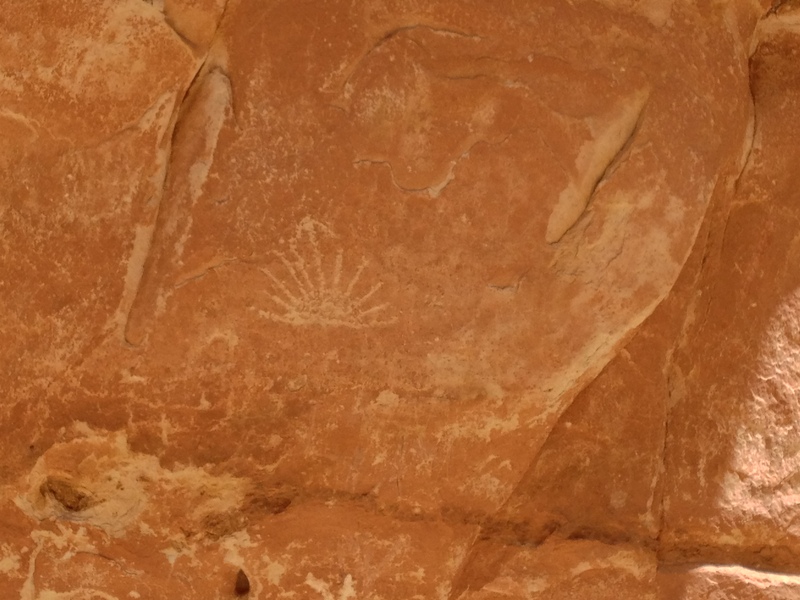 2311 – Visited Capitol Reef National Park in Utah. Notice the car on the road in front of us to get a size perspective of this area. 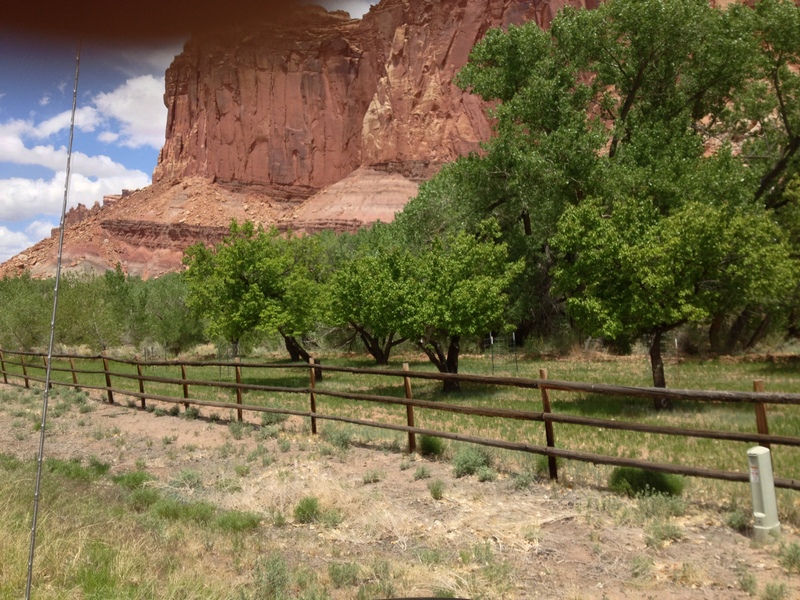 Fruit orchards which the Mormons planted in the 1800s and the National Park Service now maintain. Pies available at the park store! 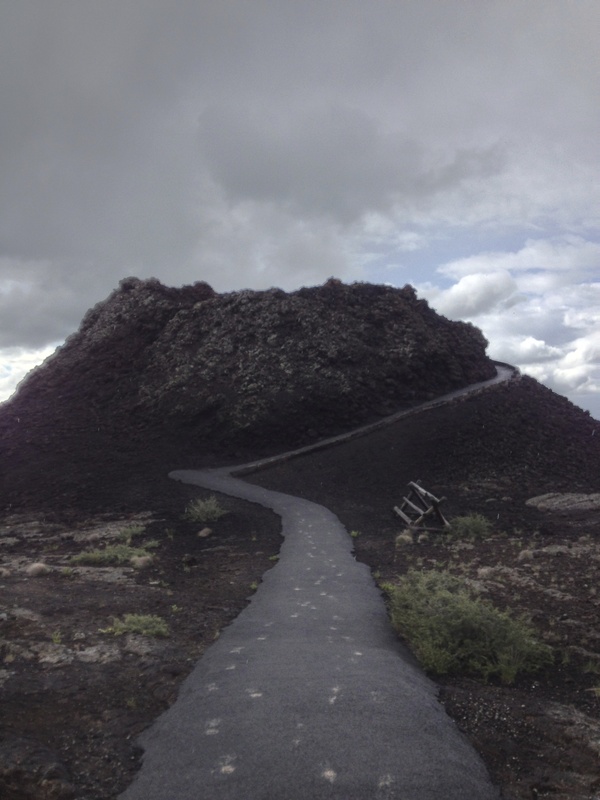 2835 – visited Craters of the Moon National Monument. 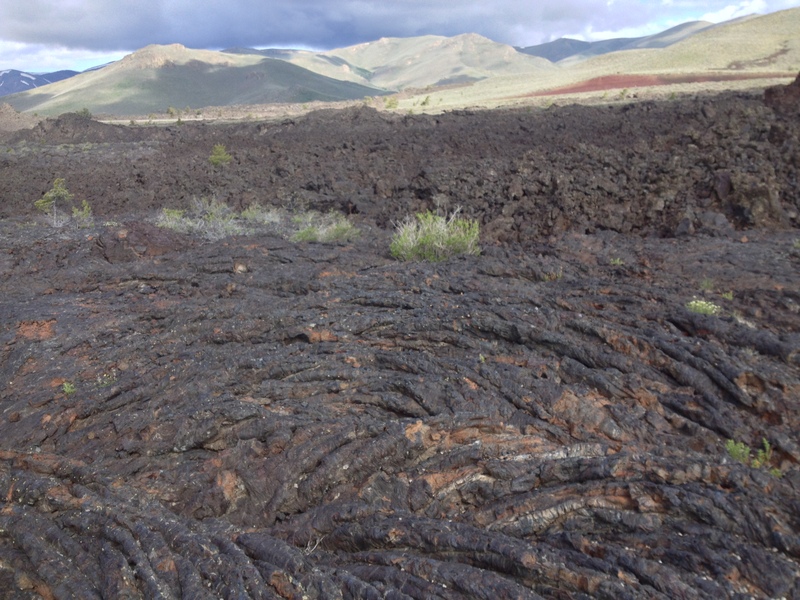 This is a huge area of cinder cones and lava rock which flowed as recently at 2000 years ago. 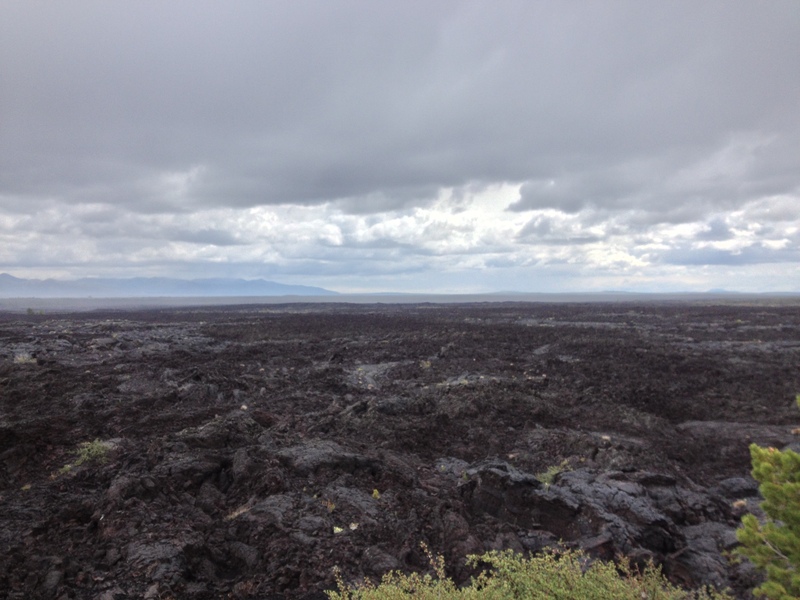 And more lava! As far as you could see. 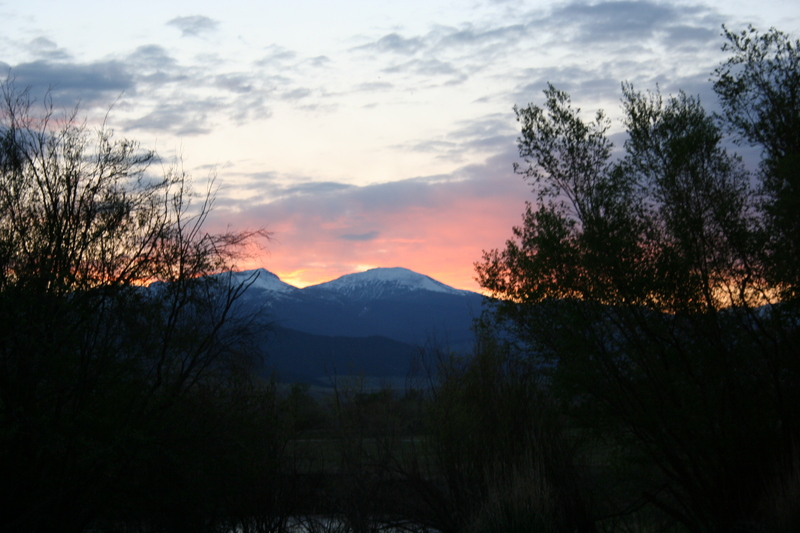 3055 – Entered Montana – where we spent 5 days opening and repairing our family “retreat”. 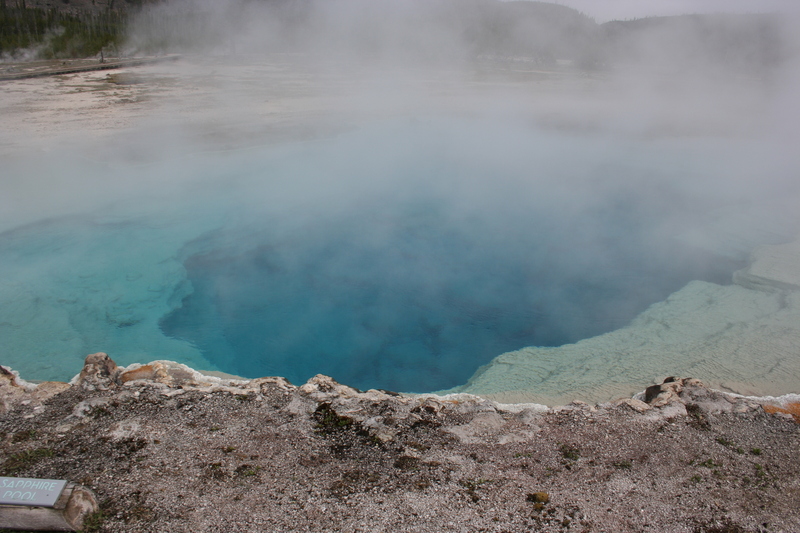 3318 – Visited Yellowstone National Park in Wyoming. 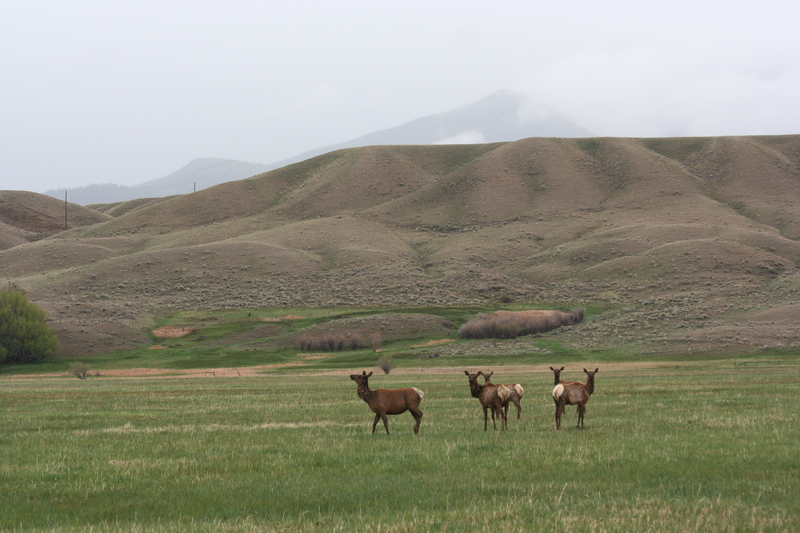 This elk walked right by our car and didn’t pay any attention to my talking to it. Bison were everywhere! Including the road. 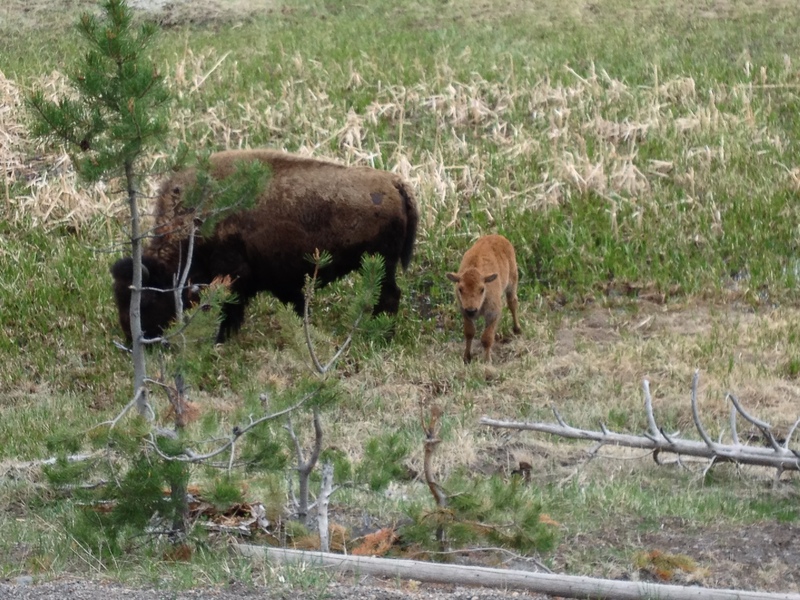 Lots of bison babies too! 5080 – Entered Illinois – where we visited with family. 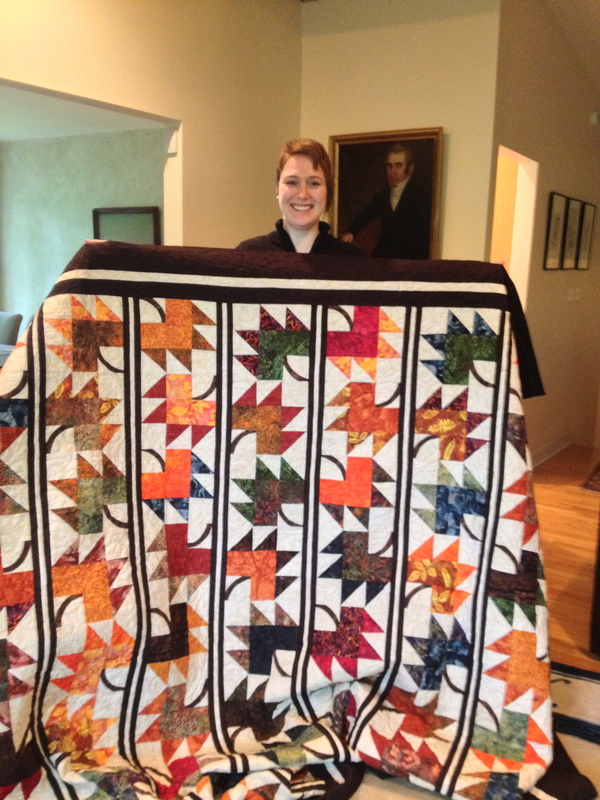 Lindsey shows off her quilt – which she just finished binding. 5893 – Home in DC. Whew! What a trip. Almost 6000 miles. Tony says, that’s a LOT of driving! Great pictures as always. First time I’ve seen a Buffalo jam. Obviously, quilting skill runs in the family. How exciting! Great photos, too!! We’ve got some of that trip in our future. Any quilts shops on the journey? Great trip! So that’s where they keep the buffalo… After all that driving, I think I would hire Peapod to deliver groceries for a week. Lindsay made a beautiful quilt! Is that from the wedding fabric? How wonderful that trip must have been! Looks like you had a beautiful experience. But what a crazy number of miles!! I am really hoping we can go on a bit of a car trip this summer too. Amazing!! I feel like I was sitting beside you the whole time. What great pics!! 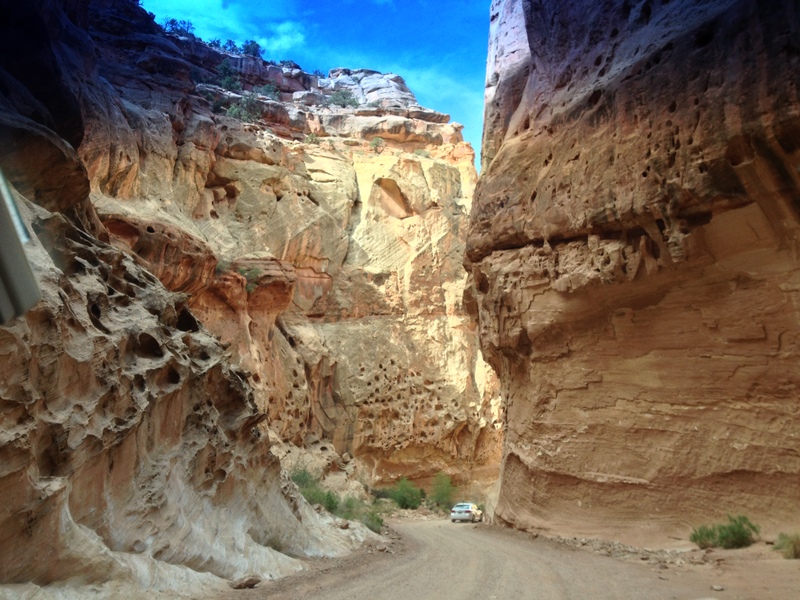 Wow – what a trip! And great pics. 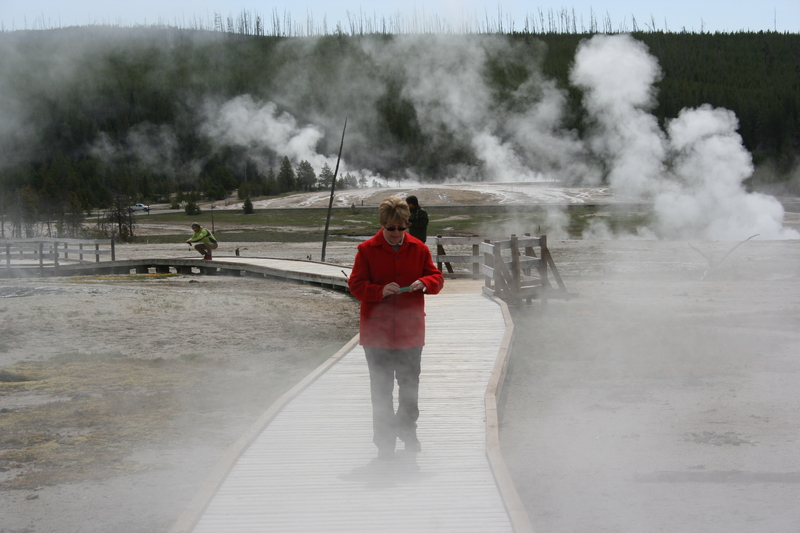 Wonderful trip……glad you got to enjoy so much of the USA. Lindsey’s quilt is BEAUTIFUL. She is a talented lady.